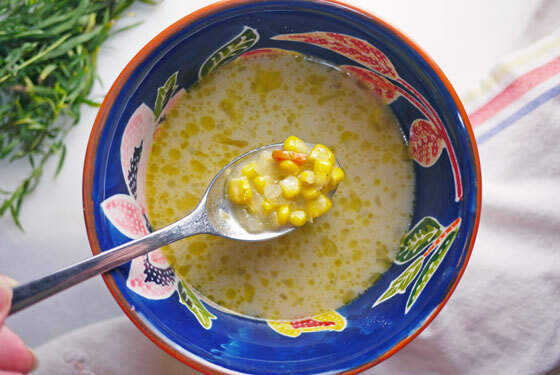 This soup is the essence of summer: light, rich, and full of sweet corn flavor. This isn’t a super thick and creamy winter chowder, but is delicious all the same. And quick, too. It comes together in just about 15 minutes. Can you imagine that—a perfect summer soup in just 15 minutes?! If you don’t want to make corn stock, but you want to keep this vegetarian, substitute vegetable stock. If you don’t care about keeping it vegetarian, then use chicken stock and maybe—just maybe!—throw in some bacon. Brown it, set the crispy bits aside, and use the rendered fat in lieu of (or in combination with) the butter called for at the beginning of the recipe. This is yet another excuse to eat corn and enjoy the last tastes of summer. How can you resist?! 1. Melt butter in a large pot set over medium heat. Sautee onion, carrot and chilies until soft and fragrant. 2. Add corn and sauté about 3 minutes until just soft. In the meantime, whisk sour cream and masa flour into broth. 3. Add broth/sour cream mixture and milk to the sautéed vegetables. Allow to come to a soft boil before turning the heat down to medium-low. Simmer for 10 minutes to allow all the flavors to come together. Serve hot! Allow leftovers to cool completely before covering and storing in the fridge for up to three days or the freezer for up to three months.